Six weeks ago I wrote about Alfred, a 74 year old man who during his life made a $14 million fortune in stocks by always being invested in the Dow. Alfred never analyzed the US or the world economy. Nor did he analyze a single stock. Always being in the market was his secret. Alfred is not a deep thinker so he hasn’t thought about how fortunate he has been. During his 74 year life, there has been no major war. Nor have there been any depressions and economic downturns have been minor. He has had a job all his life and has thus never been exposed to unemployment. Alfred, like most investors, has been totally unaware that he has had major assistance from the government, which throughout most of his life has expanded credit and printed money. Alfred has been lucky to be shielded from any major calamities. So have his children and grandchildren. His children are in their forties and have a good education and good jobs. His grandchildren are between 10 and 17 years old and have also had a very good life. Thus, three generations have, so far, had economic prosperity and no wars. This is a unique period in history. To have 3/4 of a century without a major war or economic misery is remarkable. Just basing the prospects in the next few decades on probabilities, Alfred’s children and grandchildren are unlikely to be facing the same sunny prospects that Alfred has had the privilege to enjoy. Economically, the world has been digging its own grave. Decades of deficit spending, and credit expansion has given Alfred a standard of living and quality of life that his offspring are very unlikely to see. How could that debt ever be repaid? We are only in the 19th year of this century and global debt has already more than tripled from $80 trillion to $250 trillion. Part of this debt has contributed to Alfred’s wealth of $14 million. This incredible debt creation has bolstered asset markets for the benefit of the top 1% in the world with the remaining 99% lumbered with the debt. But they are of course never going to repay it. When the debt crisis starts, which probably will happen within the next 12 months, there will be more deficits, more debts, and more money printing. Central banks are going to attempt to inflate the debt away but they can of never solve a debt problem with more debt. This time the biggest QE operation in history will have no effect. In 2007-9 the total QE, credit expansion, and guarantees, were at least $25 trillion. Next time around, it is likely to be in excess of $100 trillion as the $1.5 quadrillion derivatives bubble blows up when counterparties fail. As the world discovers that central banks are failing with their hyperinflationary money printing bonanza, there will be panic. So can the coming economic collapse be stopped by MMT? Hardly! 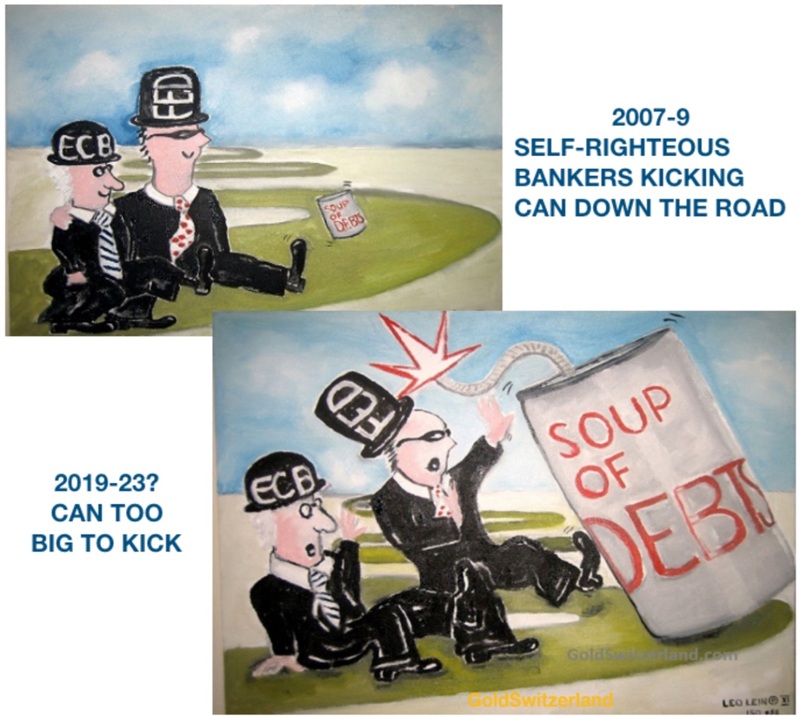 In 2007-9 the Fed, ECB, and other central banks, managed to kick the can down the road for a decade, which is remarkable bearing in mind how near the system was to total collapse. But this time the can is just too big and no kicking will dislodge it. At some point in the next few years, the biggest asset and debt bubble in history will implode. The debts, which no one can repay, will be worth zero. And all the assets that were artificially inflated by this debt will also implode. There will be very little or no money in circulation since the banking system will fail. So what will happen to Alfred and his savings that he was planning to leave for the next generations? Well, stocks are likely to decline by 95% in real terms. This might sound like scaremongering and highly incredible. But we must remember that in 1929-32, the Dow lost 90% and it took 55 years for the Dow to regain the 1929 level, and that was with inflation. Today, the situation is exponentially worse, both for the US and the world, whether we look at debt, asset bubbles, currencies or derivatives. Thus a 95% fall in real terms is certainly very likely. This means that many stocks will go to zero and most companies that are highly leveraged will not survive. 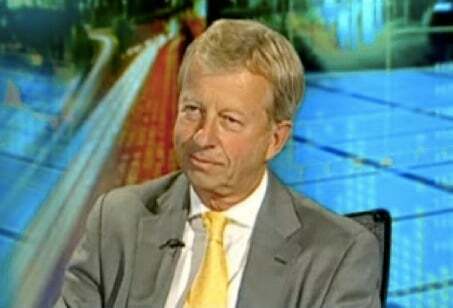 If his $14 million portfolio goes down by 95%, poor Alfred will be worth a mere $700,000. But even worse, his pension that he has built up over 50 years will most probably be worthless. And don’t think that the government will be able to help Alfred at that point. They obviously won’t since their tax revenues will be minimal. Nor will they have any ability to issue debt of any significance. The credit worthiness of a bankrupt borrower is negative so no one will buy debt instruments that are not worth the paper they are written on, even if they yield in excess of 20%, which is likely. 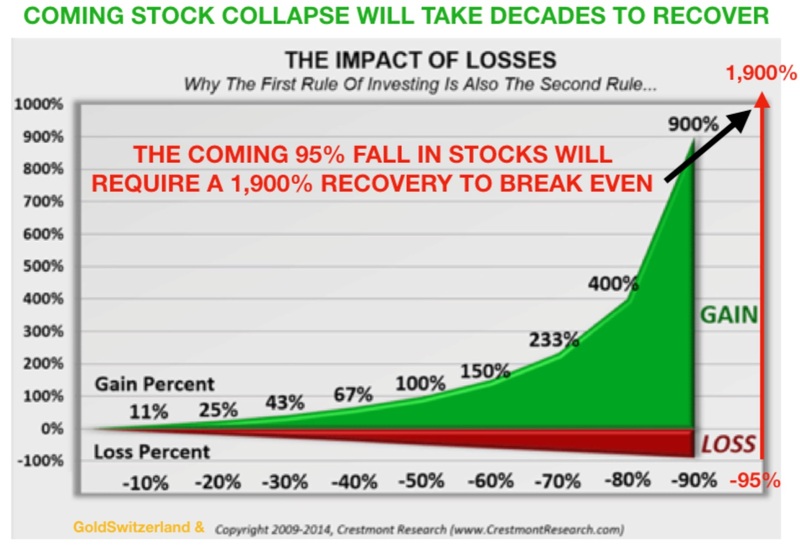 Also, virtually nobody will have any money to invest since they will have lost it all in the crash. Alfred may not need much money to get by since his house is paid for and his $700,000 portfolio might be sufficient to scrape by with a very frugal lifestyle. So is there any chance for Alfred or his heirs to recover part or all of the original value of the portfolio? Very unlikely, I would say. As the chart below shows, a 95% decline in the value of the portfolio means that the gain from there must be 1,900% to get back to the original value. We must remember that the world will have gone through a massive reset, which will have decimated the world economy and productive capacity. It will have also made debt financing extremely difficult. Thus, the world will experience a devastating wealth and debt implosion accompanied by an erosion of productive capacity. Whether this all happens very quickly or over an extended period, only future historians will tell the world. Whatever governments and central banks do to try to save the world, they will fail this time and the suffering for the world will be tremendous. In addition to financial hardship, we could also see social unrest, civil war, and war. All of this may sound extremely alarming and depressing and it clearly is if it comes true. But there are some real advantages too. First, the world could never continue to grow soundly on a foundation of debts and derivatives of $2 quadrillion. Only by eliminating this toxic debt can the world economy recover again. It will be like a massive fire, clearing out all the dead wood and allowing green shoots to come through again. Another benefit will be that moral and ethical values will return. Rather than ruthlessly chasing false values like the golden calf or the 7 sins of greed, envy, gluttony, wrath, etc, the only way to survive the coming period will be virtues like kindness, true love, humility, honor, honesty, integrity, and real friendships. Family and close friends will again become the kernel of society and extremely important for spiritual and physical survival. We must remember that whatever happens it won’t be the end of the world. It will be different and there won’t be the decadence that signifies the end of a major era like we are experiencing now. Life will go on and although many people will suffer severely during the transition, the coming reset will create a better world. The events that I describe will probably start in 2019. We are likely to see the beginning of the stock market collapse this year. Fundamentally, markets are guaranteed to implode. Technically we might still see the last hurrah with markets making new highs before they turn down in earnest. So whether they go down from here or see a few months of higher highs is totally irrelevant. The risk is massive and the coming fall will be devastating and extended. Gold is going through a final correction that could last a few weeks. But the downside is very limited and once the correction has finished, we will see gold penetrate the Maginot Line at $1,350 and quickly go to $1,600. It is also possible that we will see a new gold high (in dollars) above $1,920 in 2019. Remember that gold has already made new all-time highs in many currencies, so we will not see strong resistance at $1,920. As always, investors should not follow the West, which officially sold a major part of its gold until 2000. Since then, they have most probably either covertly sold or leased most of its gold to the wise people in the East. And that gold will never come back to the West. 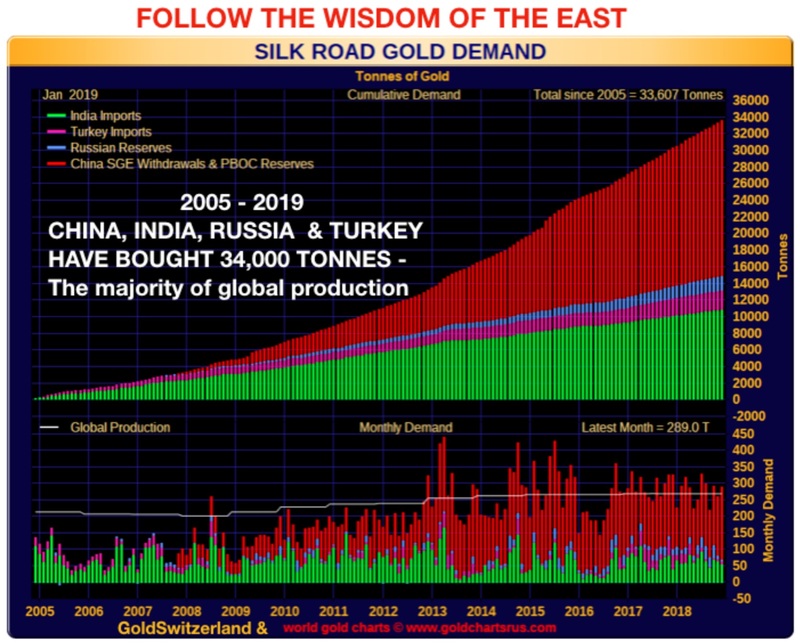 Looking at the chart above, these four Eastern countries have, since 2005, accumulated 34,000 tonnes of gold. This is the majority of global mine production. They know that gold is the ultimate protection against a rotten currency system and a failing world economy. So who to follow? The foolish West or the wisdom of the East? Not a difficult choice…For those who would like to read more of Egon von Greyerz’s fantastic articles CLICK HERE. ***KWN has now released the powerful audio interview with James Turk and you can listen to it by CLICKING HERE OR ON THE IMAGE BELOW. ***Also just released: ALERT: “Let’s Blow This Bubble Sky High” CLICK HERE TO READ.